(Newser) – The amount of sea ice in the Arctic is on course to hit a record low well before the end of melting season, scientists warn. The previous record was set in 2007, but that was a result of a "perfect storm" of conditions, while this year's melt is more like a "new normal" as climate change accelerates, experts tell Reuters. "What you're seeing is more open ocean than you're seeing ice," says the lead scientist at the US National Snow and Ice Data Center. 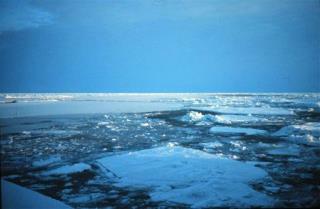 "It just doesn't look like the Arctic Ocean any more. " Think of the wonderful economic opportunities that await us. We get to rebuild coastal cities 30 miles inland, on stilts. And Greenland will become the New "Costa Del Sol". Global Warming - Bring it on Its gonna make me rich. I could have sworn that a few years ago Al Gore said all the ice was melting. Must have really slowed down a lot, it's not like it can freeze again. Just a thought here. In the Middle ages 700 AD to 1300 AD the oceans levels were 10 inches higher than they are today. Why do you think that was?